We’ve been learning about weddings this month, looking at different traditions in religions and countries around the world. 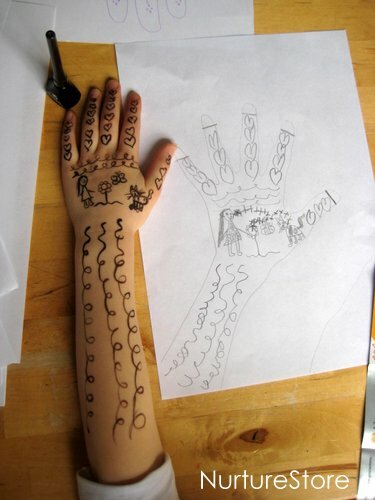 The children especially liked the beautiful henna patterns that are painted onto the hands of a bride in many Hindu and Muslim wedding ceremonies, so we thought we try hosting our own mehndi party. We started off by drawing around our hands on pieces of paper, so we could practise our designs. 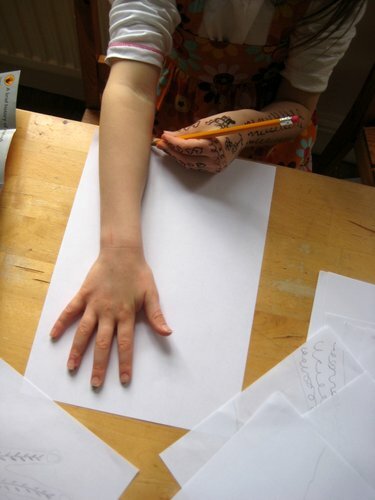 I knew the children would want to draw and draw, so starting off on paper first gave them plenty of time to enjoy making their designs before deciding on their favourites to go on their real hands. 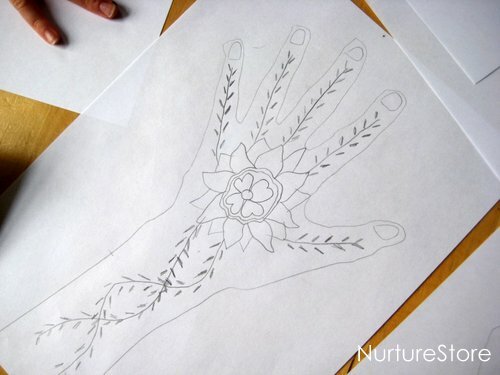 We researched the traditional mehndi patterns that a bride might have painted on her hands. The kit told us the designs originated in Africa thousands of years ago, before spreading through the Arab world. North African mehndi patterns tend to feature natural emblems such as birds and flowers, and Indian patterns tend to be more geometric, so we tried out some of each. 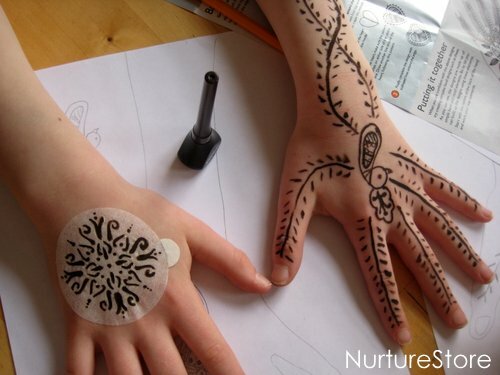 The kit came with a stencil but drawing free hand was really easy – and fun! It was a wonderful maths lesson – lots of symmetry, counting of marks and repeating patterns were incorporated very naturally in the children’s designs. It was also a really lovely event, bringing us all together. We were just sat round the kitchen table, drawing and chatting, but it somehow had a extra special feel to it. A mehndi party as part of a real wedding celebration must be wonderful. The children were so delighted with their finished designs, and everyone they met over the next day or so (including every Rainbow and Guide in their packs!) were given a show-and-tell of their hands and feet. 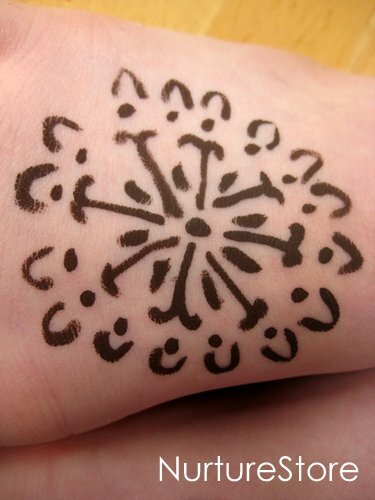 Have you ever used henna, or been to a mehndi party? My girls would love to know! 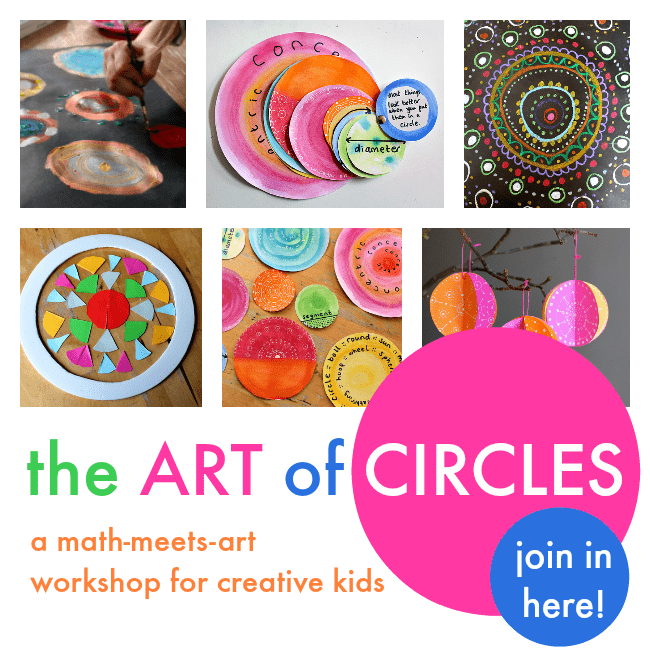 If you like combining math and art, and if you’re looking for play-based exploration and discovery of math and science concepts, come and take a look at our Fizz, Pop, Bang! Playful Science and Math Activities. You know, we’ve never done this, but I have a feeling my daughter will completely FREAK OUT at the idea of doing this. So excited. 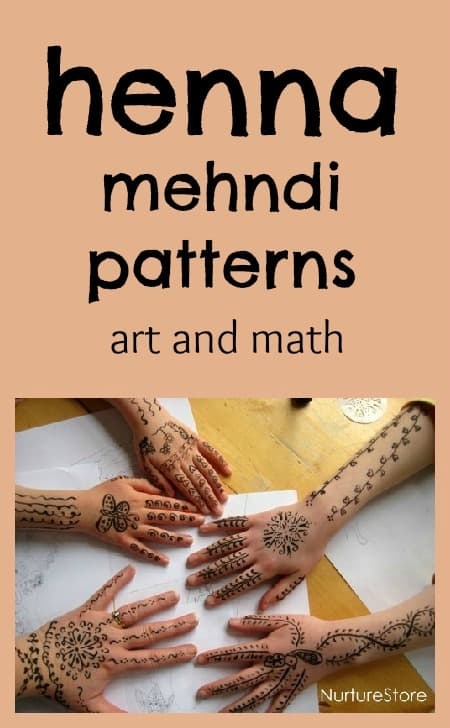 Great idea to use mehendi as a math learner.. we use mehendi all the time – its my hobby and my son (3 yrs old) has picked it up form me. we use it to teach flowers, fruits, vehicles etc… but never thought of using it for maths.. This was our first go at using sowmya, and we loved it! Yes! I live in Asia right now and I love getting henna done on my hands and feet. It is so intricate and decorative. It’s also used for holidays and just for when women want to dress up a little more. Great idea for a math lesson. I will remember this when my kids get a little older. 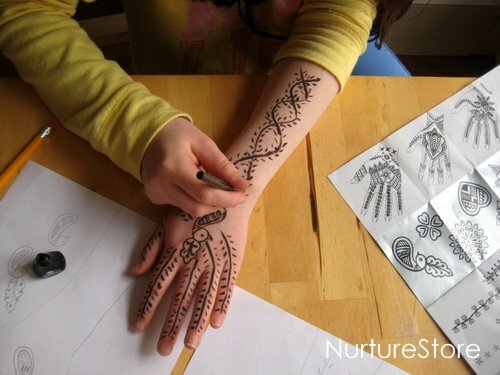 My daughters are Asian/Mexican/American so henna is one of their preferred things to do that helps them feel connected with their cultural background. We use the real henna, it is the safetiest on their skin.